Kazerne Dossin only received a photocopy of the original letter. Salomon Jakob Florsheim was born in Hamburg, Germany, on 8 February 1893. He married Eva Florsheim, maternal aunt of the donor, with whom he would have two sons: Julius born in 1925 and Karel born in 1928. Salomon Florsheim became a banker. After emigrating to the Netherlands he and his partner Siegfried Kramarsky took over the ‘Lisser & Rosenkranz’ bank in Amsterdam. During the war, the Florsheim family was interned in Westerbork, but they became part of the privileged Barneveld group. Therefore, Salomon, his wife Eva and their sons were not deported to an extermination centre but to the Theresienstadt ghetto where they arrived on 5 September 1944. All four family members survived deportation. Post-war Salomon reached out to Siegfried and Lola Kramarsky, his pre-war associate in the bank industry, who had made it to New York before the war. Salomon Jakob Florsheim passed away in Israel in 1979. 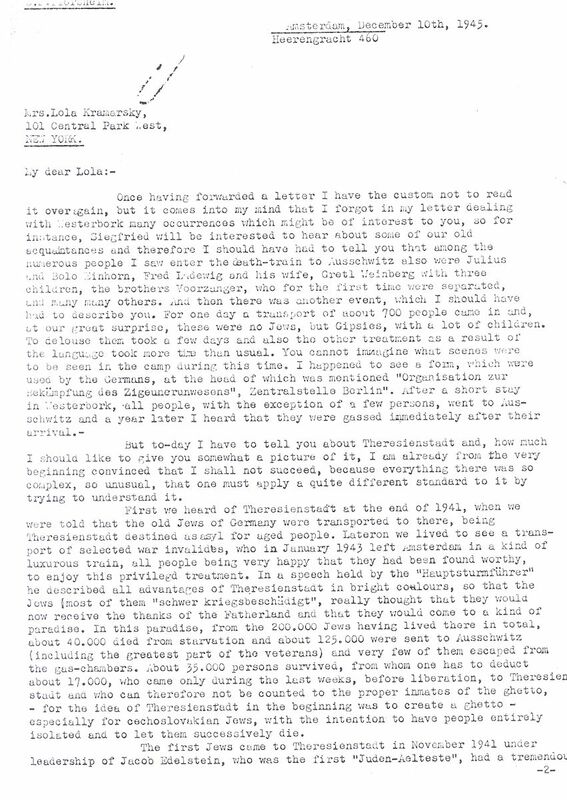 Josef Rothschild donated a copy of Salomon Florsheim's letter to the Jewish Museum of Deportation and Resistance, predecessor of Kazerne Dossin, in 2007.